The astronauts living aboard China's Tiangong 1 space module received an email from ground controllers that contained photos, text and videos, officials at the Beijing Aerospace Control Center confirmed to the state-run Xinhua news agency. The crew, which includes China's first female astronaut, launched into orbit aboard the Shenzhou 9 spacecraft on Saturday (June 16). Two days later, the spacecraft automatically linked up with the Chinese Tiangong 1 test module, marking the nation's first manned space docking. The successful maneuver made China only the third nation, after the United States and Russia, to accomplish such a feat. The achievement is a critical step toward China's ambitious goal of building a space station in orbit by the year 2020. 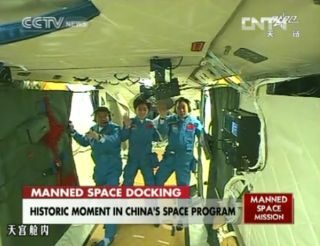 The Shenzhou 9 mission also includes another first for China, the flight of its first female astronaut Liu Yang. China's astronauts aren't the only residents in Earth orbit to be able to get emails from home. The six-man crew on the International Space Station, a 15-country project that does not include China, regularly uses the Internet to receive emails, and even post Twitter updates, blogs and spectacular pictures of Earth from space. The Tiangong 1 test module launched into orbit in September 2011. An unmanned vehicle, Shenzhou 8, lifted off in November of that year and completed China's first automated space docking. The crewed Shenzhou 9 docking represents a significant technical milestone for China's space program. The country intends to build a space station in orbit by the year 2020 and one day land its astronauts on the moon. Last December, Chinese space program officials unveiled a white paper listing the country's space exploration goals, which include the large 60-ton manned space station as well as a mission to return samples of the moon to Earth by 2016 using a robotic spacecraft.